Paradise Garden Animal Haven provides spay/neuter services pet owners in our area who are not able to afford the fees charged at their veterinarian's office, or who have multiple pets and can't afford to get them all fixed (e.g. feral cat colonies). Please download our application and our price list, and mail or e-mail it to us. We will call you to set up an appointment. While our prices are much lower than those you'll find at the vet's office, for some families, they are still too high. Thanks to the , we are pleased to offer grants to qualifying individuals that will cover a significant amount of the cost of the spay/neuter surgery. If you qualify for the grant, you will pay only $10 for each surgery, plus the cost of vaccinations, if needed. To see if you qualify for the grant, please click here. 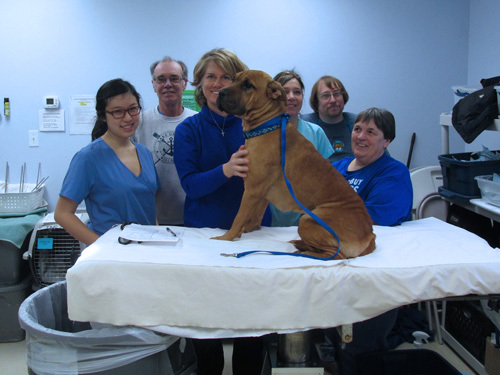 Our clinics are done in partnership with Shelter Outreach Services of Ithaca and are held five times a month at the Chemung County SPCA. These surgeries are by appointment, and it may take a few weeks for your pet to get an appointment. Those who receive the ASPCA grant will pay a $10 copay for the surgery; others will pay more (see the price list on page 3 of the application). Rabies and distemper vaccinations are required, and if they are not up-to-date, you'll pay $7.50 per vaccine. You can pay for your services using cash, a check made out to "Paradise Garden Animal Haven" or "PGAH," or by using PayPal. When you click the button below, you will be redirected to our secure PayPal Donation Portal. Simply enter the amount, click the "Donate" button, and put what services you are paying for in the comment section when you submit the payment. Our grant funding for 2017 - 2018 has been exhausted. We appreciate your patience as we work to gather more funding for our lowcost spay/neuter programming. Property owners known for feeding outdoor cats or property owners with lots of land are often the unfortunate recipients of abandoned cats. Feral, unsocialized cats can often be found in groups called "colonies." Unchecked, these colonies can rapidly reproduce, becoming a problem for property owners and the colonies. While some well-meaning residents trap these cats and bring them to animal shelters in the hopes of having them find a "forever home," feral cats are not adoptable and rarely do shelters have the resources to tame feral kittens. Older feral cats can not be tamed. More often than not, feral cats are euthanized if brought to a shelter. 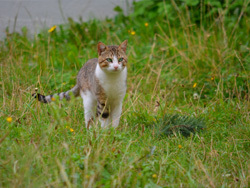 TNR, which stands for trap, neuter, and return, is the humane option for managing outdoor cat colonies. Paradise Garden Animal Haven encourages TNR for any resident who wishes to address cat population problems on their property. We will assist you in trapping your cats, getting them fixed, and releasing them on your property. No more unwanted kittens! All we ask is that you continue to care for your colony as you always have. Thus, if you were providing food and water to your colony, please continue to do so after we help you spay and neuter them. Cat colonies require minimal care once you get them fixed. Your colony members will be given a rabies vaccination, too, decreasing your liability. The cost depends on our funding and the size of your colony. We also have a limited supply of traps, so it may take some time to fix your whole colony. Please contact us for more information about our TNR program.